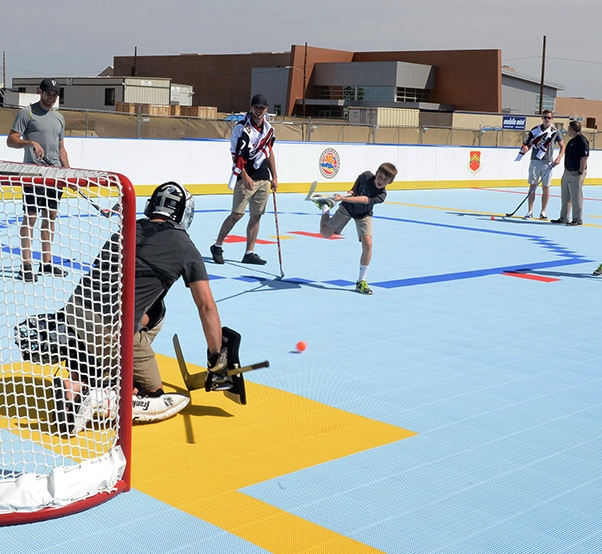 More than 100 Airmen, family members and community partners came out to mark the opening of the new deck hockey rink at Luke Air Force Base, Ariz., April 13, 2017. 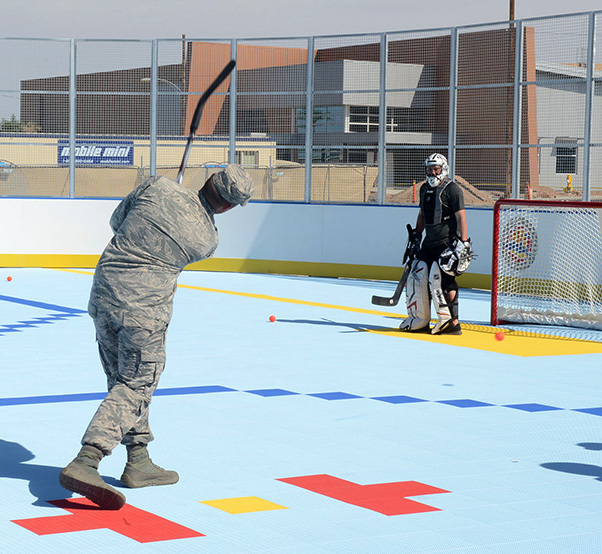 Airmen and families now have another place to relieve stress or build comradery with the opening of the new rink. Luke family members take aim at Arizona Coyotes prior to the ribbon cutting ceremony for the new deck hockey rink April 13, 2017, at Luke Air Force Base, Ariz. Connor Murphy, Anthony DeAngelo, Alex Goligoski and Jordan Martinook from the Coyotes attended the ribbon cutting ceremony to show support and give Luke Airmen some hockey tips. In support of the ribbon cutting ceremony, the Arizona Coyotes, who are also a partner and sponsor for the rink, came to Luke and held a hockey clinic for Airmen to learn a little bit of skills from the pros. 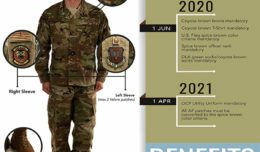 Lt. Col. Kevin Marzette, 56th Mission Support Group deputy commander, and Chief Master Sgt. 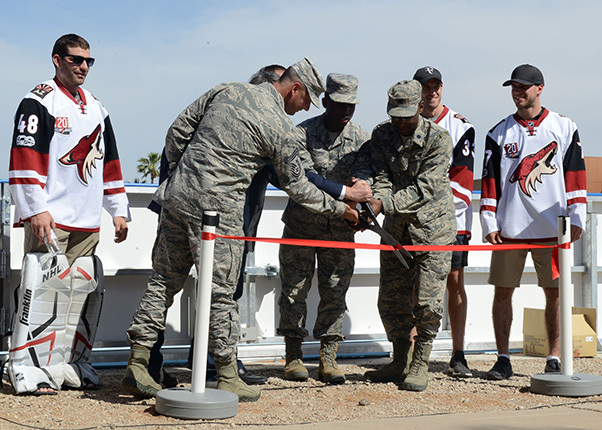 Randall Kwiatkowski, 56th Fighter Wing command chief, cut the ribbon signifying the opening of the deck hockey rink April 13, 2017, at Luke Air Force Base, Ariz. The Arizona Coyotes attended the ceremony and held a skills clinic for Airmen afterwards. 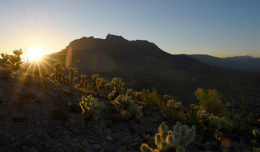 For more information on the hockey rink, contact the Community Center at 623-856-7152. A Thunderbolt takes a shot against an Arizona Coyotes player after the ribbon cutting ceremony for the new hockey rink April 13, 2017, at Luke Air Force Base, Ariz. The rink is located adjacent to the base pool and Community Commons.